Thanks to Roulette at PokerStars Casino, you don’t have to leave the comfort of your own home to enjoy all the thrills, excitement and one-of-a-kind action a game of roulette can bring. Play from less than a dollar, and experience real money roulette games in Single Player and Multi-Player mode, and on our Live Casino tables! Or try First Person Roulette, a 3D experience which combines the best of Live and Online Roulette. To learn more about how to play the game, please visit our Roulette Rules page, and don’t forget our play money tables are a great place to learn how to play Roulette for free. When prompted, you will be able to place all your chosen bets for the next round of Roulette. After you have placed your bets, the Roulette table will display up to 10 of the highest possible payouts that can be awarded, based on the numbers you have chosen. During play, the results column will also show a history of the most recent winning numbers, while ‘Hot’ and ‘Cold’ numbers (those drawn frequently and infrequently, respectively) will be noted, as well as a red/black and odd/even result ratio. The above results cannot be used to predict future results, but provide information of past games which may or may not affect your choices. For more on how to play the game, visit our Roulette Rules page. You can also play Roulette and Blackjack games on your iOS or Android device, using the PokerStars Mobile app. Enjoy the thrills and spills of Roulette from the comfort of your own home with PokerStars Casino. With lots of variants of Roulette to choose from, you’re sure to find the perfect one for you. Choose from classic Roulette and Live Roulette. Get started with Play Money and once you feel comfortable enough with the game, you can begin playing for real money in Single and Multi-Player mode. For centuries Roulette has offered casino players the glamour and excitement that Las Vegas offers today with a simple spin of the wheel. A relatively simple game to understand, it features in all online casinos or land-based casinos, and here is the PokerStars Casino guide to Roulette. Roulette in French means ‘little wheel’ and before you get started it’s important to understand the anatomy of the Roulette wheel and table. The wheel has 37 numbers, 0-36. In American Roulette there are 38 numbers, 0-36 and then a 00 slot as well. Before the ball hits the wheel, you must make a bet on the table. There are numerous bets you can make in Roulette and all bets placed are final once the ball hits the wheel. Once the wheel stops and the ball lands on a number pocket, the croupier will pay out the players on the table who chose the correct number at the correct odds. After this, another round will begin and the game continues the same each round. In Roulette there are numerous bets you can make. You’re not restricted to making one kind of bet as in many other table games. Straight Up – A single bet on any number on the Roulette table. Split – Bet on two numbers simultaneously. Place your chip in-between two numbers and if the ball lands on either number, you win at odds of 17:1. Street – A street bet is when you bet on three numbers simultaneously that all appear in a row on the grid of numbers on the Roulette table. Winning Street bets pay out 11:1. Corner – Also known as a Square or Box of Four bet, this is a bet placed on a block of four numbers on the grid. You must place your chip at the meeting point of all four numbers for the bet to be valid. Winning bets pay out at 8:1. Six Line – in a nutshell this is two Street bets combined. A Six Line bet is a bet on two adjoined streets. Bets can be made by placing your chips at the intersection of two streets and the odds are 5:1. Five Number – Or a Basket Bet, can only be played in American Roulette. A bet that’s rarely made but involves a bet placed on both zero pockets (0, 00) and 1, 2 and 3. Your chip must be placed on the edge of the adjoining line between the zero pockets and the 1, 2 and 3. Neighbour Bet – placing a bet on five numbers all next to each other on the wheel rather than on the table, e.g. 15, 34, 22, 5 and 17. This is better known as a 22 Neighbour Bet in American Roulette. First 12 – a bet that covers the first dozen numbers on the Roulette table (1-12). This bet can be placed on the ‘1st 12’ section of the table. Second 12 - a bet that covers the second 12 numbers on the Roulette table (13-24). This bet can be placed on the ‘2nd 12’ section of the table. Third 12 - a bet that covers the third 12 numbers on the Roulette table (25-36). This bet can be placed on the ‘3rd 12’ section of the table. 1-18 - As it says, this is a bet placed on numbers 1 to 18 using the designated section on the Roulette table. 19-36 - As it says, this is a bet placed on numbers 19 to 36 using the designated section on the Roulette table. Even - Bets placed on all even numbers on the table. The ‘Even’ section is placed next to the ‘Red’ section on the table. Odd - Bets placed on all odd numbers on the table. The ‘Odd’ section is placed next to the ‘Black’ section on the table. Black – Bets placed on only the black numbers on the table. You can make this bet by placing chips in the ‘Black’ designated area of the table. Red - Bets placed on only the red numbers on the table. 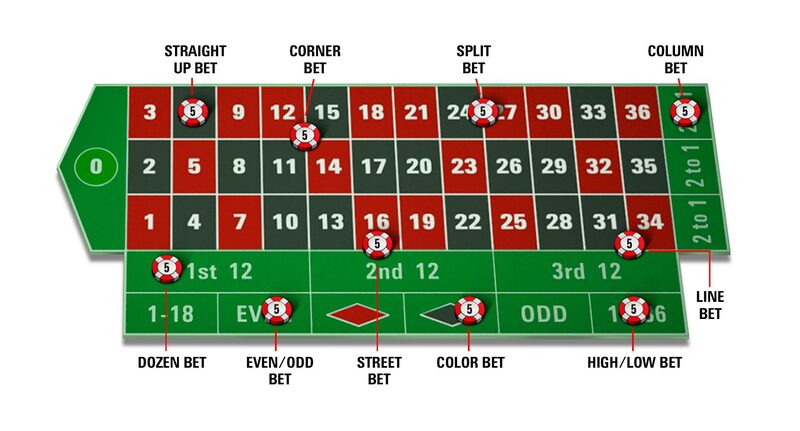 You can make this bet by placing chips in the ‘Red’ designated area of the table. If you have any questions about Roulette at PokerStars Casino, contact Support.